Recess is an important part of an active school environment. It is a relatively easy and low cost way to get students moving, and contributes to the recommended 60 minutes of daily physical activity. Recess does not only help increase students’ physical activity, but also improves both social/emotional and educational outcomes. 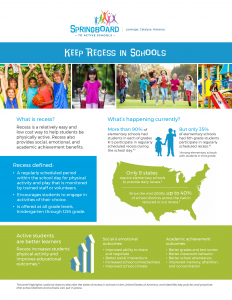 This data brief provides partners in both the education and public health field with national data that describes the state of recess in schools in the United States, and identifies key policies and practices that school districts and schools can put in place in order to promote and implement recess. The brief outlines the definition of recess, provides a snapshot of current recess practices in the US, and highlights ways to improve recess through national guidance and practical strategies and resources.